This set of Organic Chemistry Questions and Answers for Experienced people focuses on “Cycloalkanes and Cycloalkenes”. Explanation: It is almost the same as that in the case of alkanes. Here the difference is that 2 is replaced by 1-r where r represents the number of rings in them. Explanation: The melting and boiling points of the cycloalkanes are much more than the corresponding alkanes. Explanation: Cycloalkane compounds do not have a perfect tetrahedral bond angle, instead they show a minor deviation from it which leads to destabilizing effect. Explanation: Cyclopropane is the compound with the highest ring strain. This is because the carbon atoms are arranged in the shape of a triangle thus forming C-C-C. Explanation: Cyclopropane reacts very aggressively at ordinary temperatures and hence it explodes when comes in contact with oxygen. Explanation: Cyclobutane is a compound which as no commercial and medicinal importance but the complex derivative forms of them are used for a variety of purposes. Explanation: cyclopentane is a hydrocarbon with 5 carbon atoms and they are highly flammable. Explanation: This compound is a hydrophobic hydrocarbon as it is non- polar by nature. Explanation: Cycloalkenes mostly appear in liquid state but sometimes they are even found in solid state. Explanation: Cycloalkene is a compound which has carbon atoms arranged in a closed ring but they do not exhibit aromatic character. 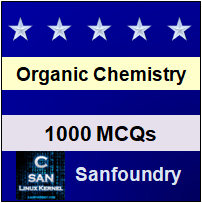 To practice all areas of Organic Chemistry for Experienced people, here is complete set of 1000+ Multiple Choice Questions and Answers.